The traditional wedding cake is typically frosted with white icing, but a new trend is brides are opting to serve naked cakes, a pair down creation that forgoes an outer layer of buttercream so that the texture of the cake on the colors inside are put on show. Chef, founder and owner of Milk Bar, Christina Tosi, is credited with starting the trend. The paired down four tier dulce de leche cake from Milk Bar is $675. Naked cakes put the focus on the texture of the cake and the colors and the flavors inside the cake. Some of them are created and filled with chocolate ganache and berries. Why not challenge the norm? According to the owner of Milk Bar she asks why am I hiding all of the colorful, textural, exciting parts of being in the kitchen behind decor? Milk Bar has locations in New York and Toronto and the price of a naked wedding cake starts at $400. Some of the flavors include a mix flavor cake with chocolate malt, pistachio, salted pretzel, strawberry lemon, and a rainbow birthday cake with vanilla frosting inside. 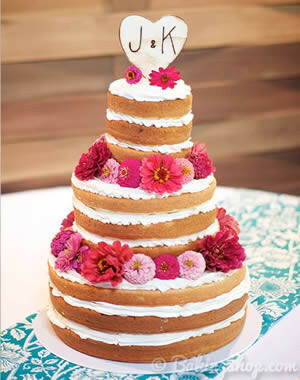 To add a bit of intrigue, the cakes are decorated in flowers, fruits, pretzels, cookie crumbs and chocolate chips. Some of the amazing delectable cakes are a Tuxedo cake made of alternating chocolate and vanilla layers drizzled with house made fleur de sel caramel buttercream. The surprise center is made of pure caramel. Another combination is a rainbow birthday cake crumble, a middle tier made of cheesecake, apple compote, and pie crumbs and a top-tier of salted pretzel cake. Clean lines and powdered fruit add to the aesthetic appeal of a naked lemon cake filled with raspberry purée buttercream. Seasonal fruit and fresh compote can add a rustic appeal to a naked cake. Some of the natural toppings are fresh fruit and drizzled preserves on the top. One does not always have to put sugar flowers on top of the cake and can let the season influence the flavor. In preparation, because they are exposed, naked cakes tend to dry out faster than traditional ones, so they should be served no more than 24 hours after being stacked. Pay attention to the colors of the filling and the cake when making a naked cake since they will have to look good together. Naturally colored cakes look the best like vanilla, carrot cake or hummingbird instead of food coloring dyed cakes like red velvet. Make sure all of your frostings and fillings make sense when eaten as a whole. Assaulted pretzel cake can be filled with ganache and burnt honey frosting. Since anesthetics are an important part of a naked cake, nothing can be massed with a layer of cream. Every felling should be a sliceable consistency when cold or room temperature. There is no hiding fillings or under set layers with a naked cake. You might think that naked cakes are less complicated than their frosted counterparts but in fact it's preparation takes quite a bit of skill.